Children and teenagers are ideal candidates for orthodontic treatment. Because the jawbone is soft and still growing, a young patient’s smile is particularly more receptive to re-alignment. In addition to enhanced aesthetics, a straighter smile also offers significant health benefits including improved speech and better access for oral hygiene. When should your kid see an orthodontist? While there is no exact age for children to begin orthodontic treatment, the American Association of Orthodontists (AAO) recommends visiting the orthodontist around age 7. By this age, most children have a mix of baby teeth and adult teeth, making it easier for the orthodontist to diagnose and correct tooth and jaw problems sooner and without surgery. Most kids just need an orthodontic evaluation, which is done at no charge and doesn’t take very long at all. However, there are children who come in for an early treatment check-up and Dr. Hessamfar can see problems that, if treated early, can avoid more intense orthodontic treatment later in life. 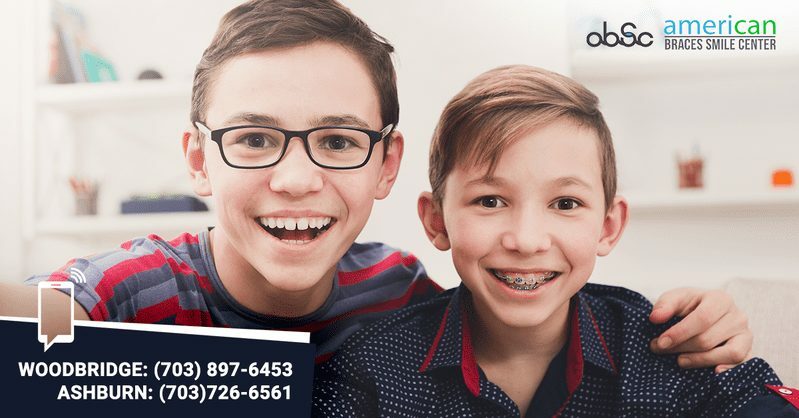 American Braces & Smile Center Broadlands Orthodontics can walk you through what to expect from every type of treatment. We are conveniently located in Woodbridge VA and Ashburn VA the two of many beautiful towns in Northern Virginia. Give us a call today and bring your kids for a free consultation. Most bite issues are inherited, but they can also be caused or exacerbated by habits and behaviours that are common with young children including finger sucking, overuse of pacifiers, poor nutrition and poor oral hygiene. To determine if your kid will benefit from braces, we will perform several painless diagnostic procedures. This initial phase may include panoramic X-rays, bite impressions, and computer-generated images of the head, neck and jaw. These steps also help us to decide on the best treatment option for your kid. Who needs early orthodontics treatment ? Braces are common among kids. 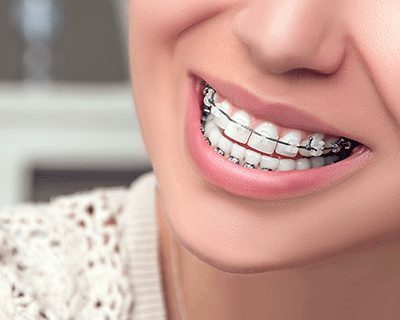 For this reason, the embarrassment factor is low when compared to adults, and therefore we often use traditional metal braces on kids. Colorful bands are added, giving kids a new and fun way to express themselves! As a child moves into the teen years, however, he or she may request a more discreet treatment method such as Invisalign®, clear aligner or clear ceramic braces. Not everyone needs early orthodontic treatment. Dr. Hessamfar usually does not recommend treatment until most of the permanent teeth are erupted (between the ages of 10 and 12), but in some cases, early treatment can provide a substantial benefit. Even if children are not ready to begin treatment, Dr. Hessamfar will provide a complimentary annual evaluation to check their growth and dental development. He will provide advice and guidance so that any needed treatment begins at the ideal time. We are here to make your kid’s orthodontic experience as comfortable and successful as possible. Please give us a call for more information. Class I - moderate cases, where the misalignment of the lower and upper jaws is not visible but can there may be crowding of teeth. Over time this can result in uneven wearing down of the teeth and if left untreated, a moderate malocclusion can become severe. Class II - a visibly distinct overbite. This is where the teasing and name calling can occur. A child with otherwise well-proportioned facial features has a distinct look that is impacted by the misalignment of the upper and lower jaws and teeth. Class III - this is when lower jaw grows more than upper jaw or upper jaw has some undergrowth. This may or may not have a distinct underbite. Malocclusion can be hereditary, the result of prolonged thumb sucking or the use of a pacifier for an extended period of time. Malocclusions also occur if the mouth is injured in an accident and the jaw is moved by force. Learn more about the use of facemasks and palate expanders for young children! All of these treatments, when done while the child is young and still growing, can preclude the need for more invasive, more intense treatment—including oral surgery—during adolescence or as an adult.